Our classic wrap dress gets a make-over with a chic collar and A-line skirt. Go straight from the office to evening events in this feminine dress with black top and structured skirt with white base and black and yellow brushwork flowers. Pair with matching kay me jackets for work, and our taupe biker jacket for weekends. The contrasting fabrics of the top and skirt make for a dynamic dress that's crease-resistant, comfortable and stylish all day long. Our wrap dresses are a kay me classic for good reason! Now with a cute collar that's just made to show off accessories. 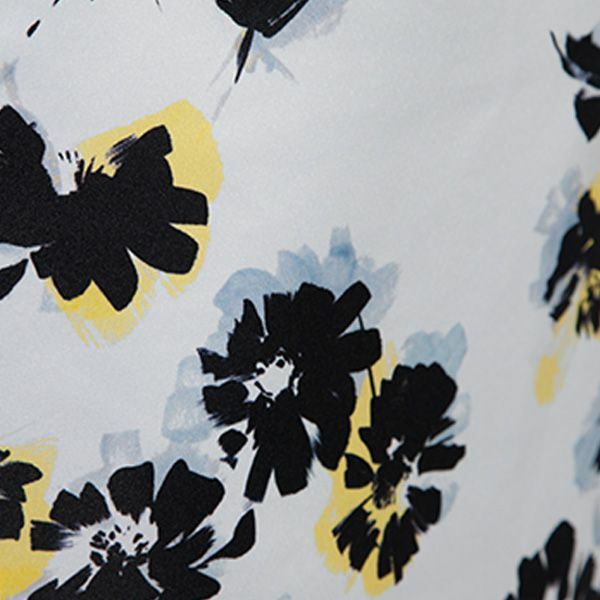 This bold print is a medley of flowers with black petals and yellow and grey swashes, making for a grown-up take on florals.